I would like to congratulate again all the successful examinees who took the 1st ever Licensure Exam for Psychologists and Psychometricians last October. Now, it's time for the second batch of hopefuls. Since, it's still 11 months away, I thought it would be great to start things over this early. Time has prevented me from taking the test last month. I haven't prepared all the requirements on time, so, I decided to give it up and try it next year. This time I promise to do it early. If you want to be prepared like me, let's take the journey together!!! So, how are we going to prepare for the upcoming batch of the licensure exam? First thing that we have to know is the reason why we now have this so-called licensure exam for psychologists and psychometricians. 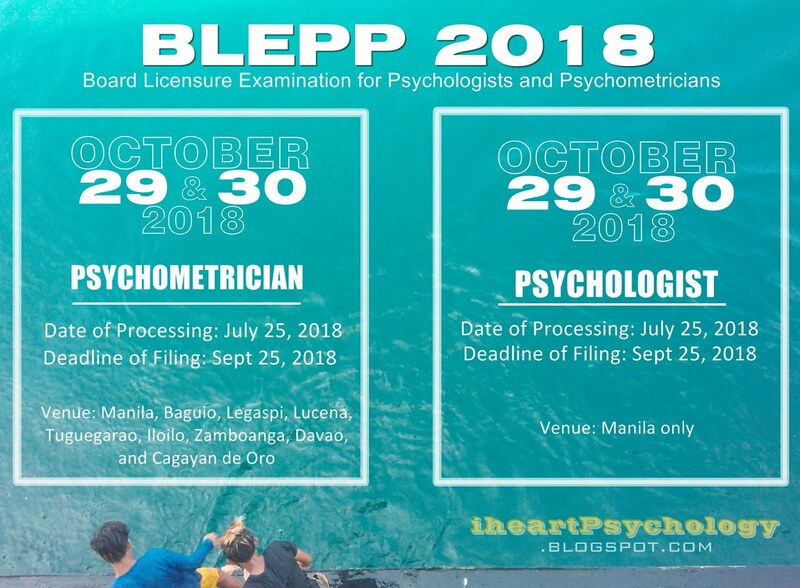 "An act to regulate the practice of Psychology, creating for this purpose a Professional Regulatory Board of Psychology, appropriating funds therefor and for other purposes..."
Through this Act, Psychology degree holders are encouraged to take the licensure exam. More about the IRR of RA 10029 here. So, who are qualified to take the Licensure Exam for Psychologists and Psychometricians? Check the answer on my previous blog post HERE. What are the subjects covered on the examination? See my previous blog post HERE. If I want to take the Licensure Exam for Psychologists what are the documentary requirements that I need to prepare? d) Certified true copy of certificate of practicum training, clinical internship or work experience stating the place of internship, detailed psychological services given and number of hours rendered which should be duly notarized. If I want to take the Licensure Exam for Psychometrician what are the necessary documents to prepare? Check my previous blog post HERE. Lastly, how are we going to prepare/review for the licensure exam? Well, you have three options. Option A: Enroll yourself on a credible review center. They will surely help refresh your knowledge in Psychology. The advantage of this, is that you would be given a lot of references, review materials and you will have plenty of practice tests. The only downside, review centers can be costly. I have some review centers HERE. Option B: If your school offers review session, join them. There's no better way to review, than with your alma mater. Your previous professors or your dean would surely help you review since you will also bear the school's name when you succeed. Your professors would be more motivating than any other instructors out there (well if they're really the motivating type). The advantage is that you might know the instructors personally and be comfortable with their teaching style. Option C: Self-review. The advantage, you control the expenses and you control the schedule. The cons, minimal references if you're not the resourceful type, not motivating if you're not really the studious type. In my case, I've decided to try the licensure exam by just reviewing all by myself. I mean reviewing on my own, reading stuff and answering practice tests on my own. Because I don't want to be disappointed (financially) if I fail it the first try and I wanted to test myself too. At this point, I have also completed most of the documentary requirements (because I've been preparing the papers since June 2014). I have my new TOR with CAV from CHED, my NSO birth certificate, my NBI clearance and my Good Moral certificates. But I am actually crossing my fingers that these documents would still be valid on the time that PRC would start accepting applicants for the 2015 Licensure Exam for Psychologists and Psychometricians. Aside from that, if you haven't checked my previous posts, I have also started my review specifically on Theories of Personality and Psychological Testing. So, if you are like me, hoping to take the next licensure exam, I encourage you to start processing your requirements and start browsing your psychology textbooks. If you have questions about the licensure exam please do not hesitate to leave your queries below. I will try my best to answer your question ASAP. PS I am still revising my Theories of Personality Reviewer. Miss Layne, you may have to re-apply for some of your documents. When I applied for the exam earlier this year, the PRC told me that the Cedula has to be the same year as the time you will apply. They also told me that the Good Moral Character certificates are valid for 6 months and the NBI clearance is only valid for 1 year since the application for the clearance. Ok I need to re-apply my Good moral, Cedula and NBI. And I wonder if my NSO will stillbe valid next year since I got it like last year so... We can do this ate!!!!! Hello :) My ToR says S.O. Exempted. Do I still need to get CAV from CHED? Yes! You have to present the Certification, Authentication and Verification form to PRC. Hi Ms. Cari. The deadline in filing for Psychometrician is on Juy 1, 2015 :) as stated in PRC Official Website. Hi! I am hoping to apply for a license for psychometrician without examination this month as i know next month is the deadline. However i cant find/open the online registration form that needs to be submitted to PRC before actually submitting the requirements. Is there an updated step by step procedure for applying? I have the requirements already but dont know what to do next/how to apply. hi! when will be the next licensure exam mam? kelangan po ba agad makapag register? is it ok kahit 5 years ng grad?